The International Microwave Symposium (IMS) is arguably the largest single annual event for radio and microwave engineers. According to IMS2014 event officials the show in Tampa, Florida, boasted of a 7,500-visitor attendance. European Microwave Week (EuMW) runs a close second place at around 7,000. In 1958, 55,000 engineers attended the Institute of Radio Engineers (IRE - eventually became the IEEE) in New York City. IMS and EuMW would love to have numbers like anywhere near that. Maybe the large number of attendees was because dissemination of information was not nearly as instant (or eventual for that matter), and the absence of the Internet or even e-mail or online bulletin boards made face-to-face and face-to-product encounters a vital means of keeping abreast of the latest technology and regulations. 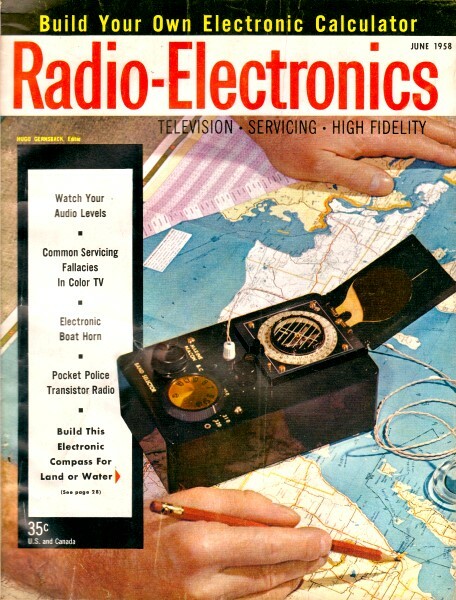 Hot topics like Electronics in Space (on the verge of reality then), and what caught my attention was this: "Luminescent panels for flat-tube television were discussed by Sylvania engineers," which coincided with discussions of plasmas. Was that early large screen TV technology or just reduced curvature CRT planning? Don't know. Raytheon exhibited a nifty liquid-filled elapsed time indicator that turns from blue to clear after a predetermined amount of electric charge (20 mAH) had been applied. This mobile antenna stands almost three stories high - its radiation center is 24 feet above the ground. A complete session was in fact devoted to thermonuclear power. Another, a panel, was entitled Electronics in Space. A more mundane subject that would have been equally surprising to the old engineer was engineering education. Two sessions were devoted to that subject, and another to a related one, engineering writing and speech. Devices that would read books and papers, then prepare engineering abstracts from them, were described, as well as an electronic Russian translator. Another complete session was devoted to masers (microwave gas or semiconductor amplifiers) and atomic clocks. One of these - a gas-cell clock described by Federal Telephone engineers - was visualized as "necessary equipment on any rocket ship." Luminescent panels for flat-tube television were discussed by Sylvania engineers, who pointed out avenues of research in that direction and reported on progress in producing moving pictures on such panels, but concluded that "major breakthroughs" would be needed before luminescent panels could he used as TV screens. Audio was possibly the liveliest subject at the convention. One complete session was devoted to stereophonic disc recordings, and another to audio, amplifier and receiver developments. It was at that session that Dr. Peter Goldmark presented his surprise paper on the CBS compatible stereo-disc system. It resembles the Westrex 45/45 system in general (Dr. Goldmark suggested that the 45/45 might be considered a special case of the CBS technique), but avoids some of the disadvantages of that system by putting most of the program into the lateral signal fed to the cutter. Only a few percent of the total signal remains for the vertical component. The record can be played back perfectly (as a monaural recording) with an ordinary long-play cartridge. As a stereo disc it can be played with any 45/45 setup, or even with a vertical-lateral cartridge. This last feature caused Goldmark to describe it as "compatible even with the incompatible!" Wear - either with a stereo or long-play pickup - was stated to be the same as with a regular long-play record. The Raytheon operating-time indicator tube. Biology was one of the important subjects. One session was devoted to medical electronics and one to biological transducers. Top item on the medical-biological program was an infrared spectrometer-computer for analyzing complex biochemical mixtures such as hormones. The instrument, developed by International Telephone & Telegraph Corp., is expected to be of great value in cancer research. In analyzing by chemical methods, one constituent is identified and removed from the compound, then the process is repeated for another - a time-consuming and laborious process. The new method, explained president Henri Busignies of Federal Telecommunications Labs (research division of IT&T), is to treat the absorption spectrum of the compound as a signal and to use the communications man's long experience with mixing and unmixing signals to discover not only the components of the compound but also their relative quantities. A pressure transducer, working on the strain-gauge principle, that can take measurements of blood pressure inside the human heart, at the same time bringing back blood samples from the heart's interior, was discussed by electronics researchers of the Ford Motor Co. laboratory. Another paper described the use of a Nipkow disc in making· biological microphotographic measurements, and still another covered the electronic evaluation of the condition of the unborn fetus. Experiments in electronic mail sorting had been started before last year's convention. This year a whole session was devoted to the method being tried at Ottawa, Canada. Each letter is re-addressed by an operator, the new address being put on the back of the envelope in fluorescent ink. A simple code, easily learned by unskilled labor, is used. From this point, the various sortings for province, city and street address or carrier's route are entirely electronic. An almost opposite system, which handles preliminary sorts only, is undergoing experiment at Washington, D. C. Letters fed to the electronic machine are sorted by states - and a few cities. The apparatus reads type-written addresses in various sizes of type, but cannot as yet read hand-written addresses nor those written in all capitals. A new concept in the broadcasting field was presented by Leonard Kahn, developer of a compatible single-sideband AM transmission system. Described a year ago in the Proceedings of the IRE, the system has been tried out by several stations, including New York's WMGM and WABC. One sideband is greatly reduced in power without making special receiving techniques necessary, as in conventional types of single-sideband transmission. The reception in fringe areas is improved, since more power is concentrated in the single sideband, and fading - often due to interactions between the two sidebands - is not so marked. Interference can be reduced because of the smaller bandwidth of the single-channel signal. Multiplex transmission received a couple of papers. Color TV was represented by a few scattered papers at different sessions. The exhibition which is so impressive a part of the annual meetings was on a highly practical level, following last year's pattern of accenting improvements on existing practice rather than strange new equipment. One old-timer was heard to murmur that he could remember when the bulk of the exhibits had to do with entertainment electronics - broadcasting and receiving equipment - but that now it had become practically a pure military-industrial setup. A number of striking things did however appear among the 17,000-odd pieces of equipment exhibited. One of these was an elapsed-time tube exhibited by Raytheon. It looked like a miniature tube envelope with two terminals, filled with a bluish liquid. This liquid, a copper sulphate solution, gradually clears up as current passes through it, till - at the end of 20,000 microampere hours - it is entirely clear. If one wishes to find out how long a piece of equipment has been in operation while the tube still shows considerable color, a colorimeter indicates the number of microampere hours rather accurately. The device - if it reaches the popular market - should have a number of interesting applications. The high-fidelity enthusiast would be particularly interested. 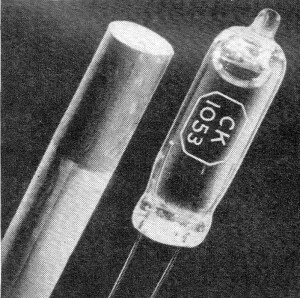 He could hook up one of these tubes in a circuit drawing 20 μa dc, and at the end of 1,000 hours the clear liquid in the tube would tell him it was time to replace the diamond stylus. A battery-operated TV set was another interesting exhibit. The battery consisted of 10 Yardney Silvercells and a solid-state converter manufactured by Interelectronics Corp. Viewers were informed that it would operate the set up to 6 hours and could be recharged overnight (at a low charging rate). Inertial guidance systems were displayed by a number of exhibitors. Inertial guidance is a method of locating one's position on the globe by starting from a fixed known point with equipment that tells how far and in what direction one moves. It consists of a "stable table" that maintains its position with relation to the earth and to any change in the position of the vehicle carrying it. Three gyroscopes, one in each direction of motion, give it that stability. Accelerometers take note of any acceleration in any of these directions, and electronic devices record their output in terms of direction and distance. It is a system which might be called super dead reckoning, and can be used - for example - by a submarine traveling under Arctic ice, to indicate its position accurately. A number of other displays were impressive in themselves, but revealed no startling advances in electronics. One, a portable antenna, brought back to the minds of old-timers the early days of portable radios, some of which were said to be best transportable by Mack truck. 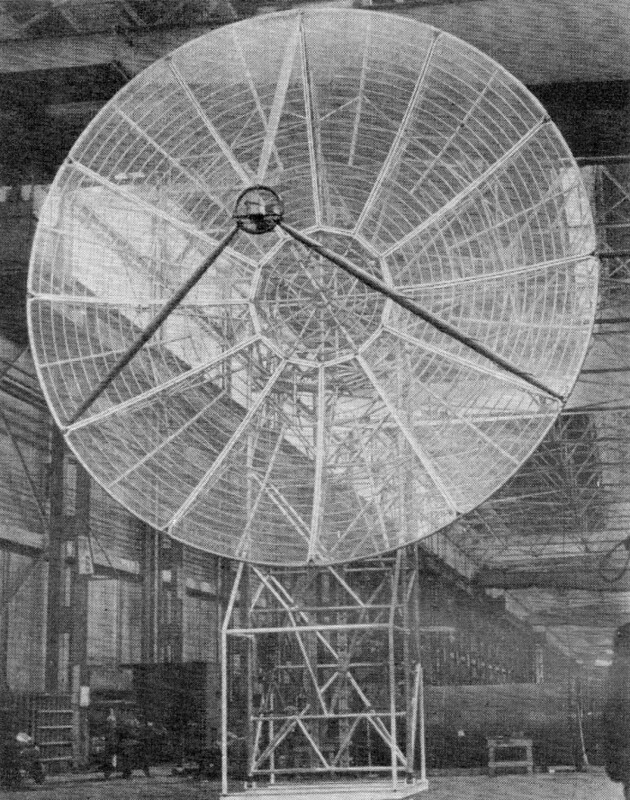 The antenna, exhibited by Kennedy Corp., was a parabola 28 feet across. It looked substantial enough for any permanent job, but two rubber-tired wheels were visible part way up the tower, and the whole job could be demounted and towed by a pickup truck. Probably it is the biggest piece of portable electronic equipment that is in existence.